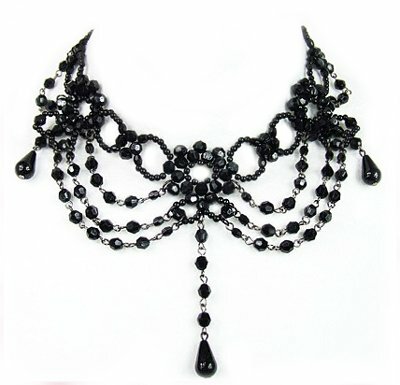 The gothic look, can be redolent with dark glamour. Indeed many designers such as: Christian Dior, Alexander McQueen and John Galliano, have channelled gothic fashion, a style which essentially is inspired by the quaint and marvelous, Victorian era mourning fashions. Described as "Haute Goth", by Cintra Wilson in the New York Times, the high fashion gothic glamour look, tends to be theatrical, extraordinary and darkly dramatic. Gothic glamour dressing also stands out from the crowd, it is rather aloof and in every way different from the popular trash fashionsthat clutter the shopping malls, manufactured cheaply for the masses. Corsets are a staple of the gothic style. Such apparel can possess high glamour, especially when fashioned from luxurious and seductive materials like: satin, velvet and lace. Colours of high gothic fashion, also tend to be opulent and extravagant, like jewelled reds, purples and emerald greens, but then there is black; undoubtedly the most preferred shade. Credit: Flickr by SoulStealer.co.ukDolce & Gabbana, Gucci and Valentino have also plumbed the dark, sophisticated and often sleek brooding gothic glamour style, as it is a vogue that can be provocative, vampy and yet elite. The drama of the gothic glamour look, also suits the vixen, who has alabaster skin, blood-red lips and luxurious hair, but the style can be interpreted as severe and sleek, dripping with satin and leather or romantically, with black lace or feathers. Gothic glamour fashion may be dark and other worldly, but even as you stand in the shadows, the power and drama of the look will ensure that you radiate a bewitching aura. At the premiere of the film, Snow White and the Huntsman, both Kristen Stewart and Charlize Theron radiated sophistication and sheer gothic glamour. Kristen Stewart unveiled a Marchesa gown of stunning black lace and Charlize Theron in Christian Dior, was a stunner in a sheer tulle creation. Both looked dark, daring, delectable and slightly dangerous. There is something aristocratic about the gothic glamour style, something of an older era of elegance, with a touch of class. The style brings to mind former days, when letters were written on scented paper in the finest copperplate script, when people sat in morning rooms and engaged in genteel talk,and sipped cups of tea. And yet with all this, there is still the electrifying undercurrent of seductive, allure, which is always foxy, yet provocative. Sterling Silver Honey Amber Victorian Pendant Necklace , 18"
Really nice writing style and another interesting article. Liked the use of the video in there too - something I haven't tried yet. Thank you very much for reading and your kind comments. Hi--As a history buff I really enjoyed the article and as always your style of penning the material. Keep up the good work and 2 BIG thumbs up from me! Thank you very much for you kind comments. However this article republished itself without my doing it, which was strange? Welll I am glad it did other wise I might never have read it!